When Jan died on September 27, I had some ideas about what I wanted to say in her obituary. I wanted to include one of her poems in it and had one in mind she’d written about Japan called Three Days. It reflected the feelings of loss that I was experiencing. That next morning, as George, Graham, Shawn and I were having breakfast, George said he needed one of us to write the obituary. 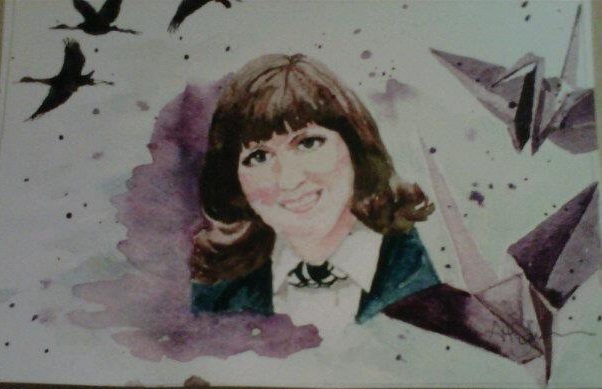 I’d written mom and dad’s, with help and input from others, and as a regular reader of obituaries in the paper (something very few people know about me…) I felt I had a good angle on how to write them well. Shawn volunteered before I could speak up, and suddenly I was faced with the prospect of having to override her offer. I didn’t want to be a petty person. I did, however, really want to do it. The grown up me took a deep breath and said, ‘how about you write it and I’ll do the review and edit it?’ That seemed to be a good compromise. Shawn went to work on it later that morning and mentioned she wanted to include one of Jan’s poems. Great minds were thinking alike. She got out “In Flight”, Jan’s book of poetry, to find one she liked. I didn’t want to sway her thinking with my choice, so I waited to see what she selected. She ultimately chose One Thousand Cranes and with that, launched a movement that has been building momentum with each passing day. After reading Jan’s obituary, Matt Hanson, a fellow volunteer at the PanCAN affiliate here asked me if he could use the poem and Jan’s story to launch an outreach program he called The Purple Crane Project. His idea was brilliantly simple – use the act of folding origami cranes out of purple paper as a means of educating students at the elementary school level and using the cranes they folded as symbols of hope for patients struggling with pancreatic cancer. Elegant, profound, and appropriate – all are words I’ve used to describe the project. Jan’s reaction would be amazement and giddiness that something she wrote could be the inspiration for such a wonderful outreach effort. 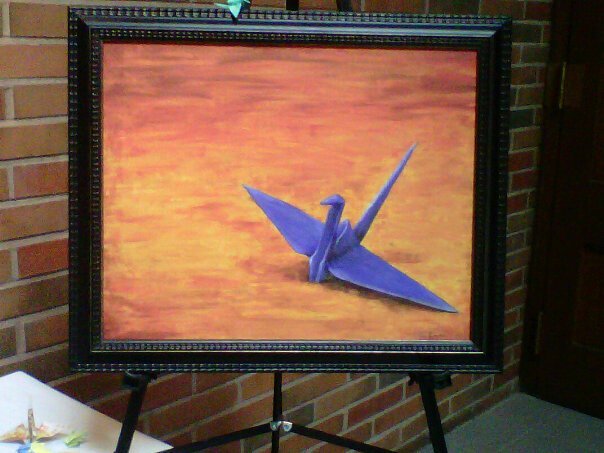 Matt planned on giving the first crane to me the day of the PurpleStride Walk on November 6. During one of his outreach visits to Virginia Mason, however, he met a woman named Debbie who was in the midst of her chemo treatments. Matt sensed her need and gave the first crane to her. It was something tangible, something unexpected, and the message on the wings hit her heart. She took the crane home and put it where she could see it every day. We all realized that this had some powerful potential and would be a meaningful activity to share. 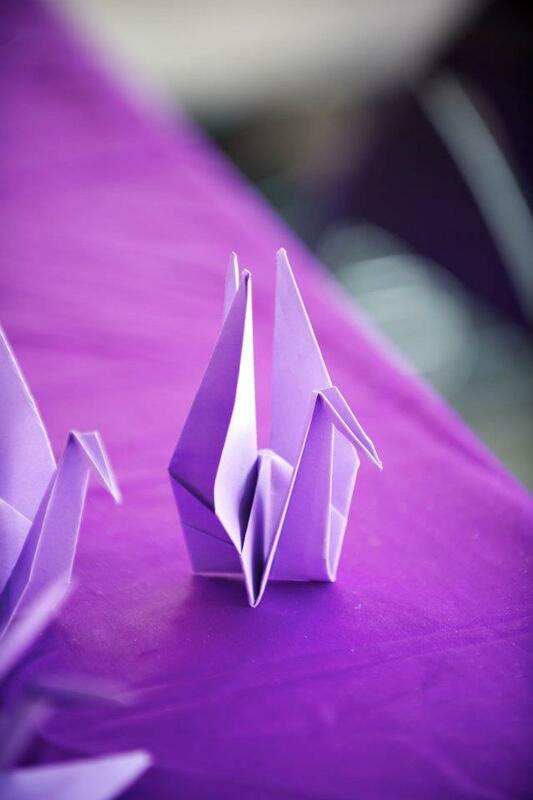 To date, over 1,000 purple cranes have been carefully folded and thoughtfully given away. The message has gone out around the world and people are working to create similar programs in other regions. The reach of these beautiful birds has been more than amazing. It has been magical. In Japan, the tradition Senbazuru, the act of folding 1,000 cranes is done when someone has a wish, be it for peace, health, or luck. 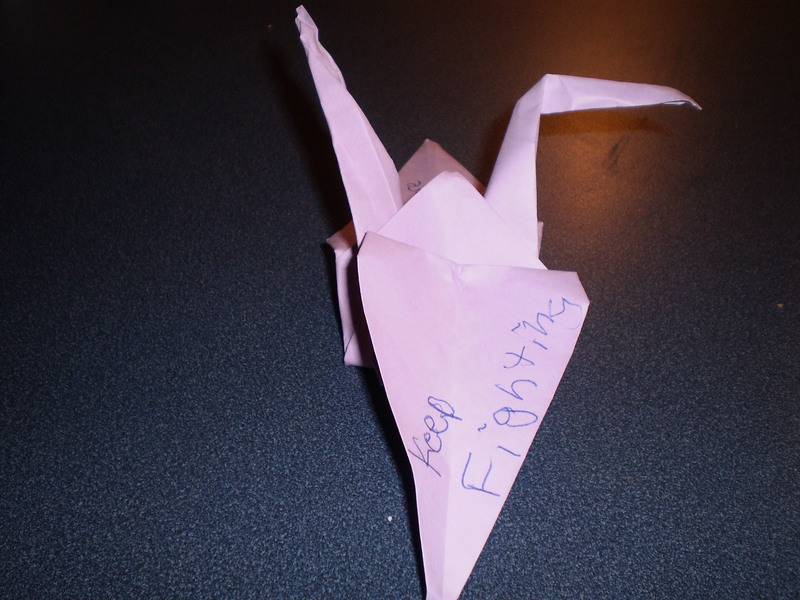 Folding the cranes is a true labor of love, as reflected in Jan’s poem. 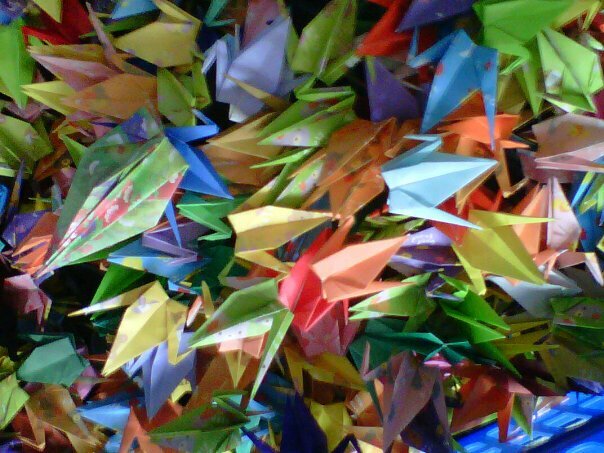 At her memorial service, several thousand cranes in all sizes and colors were delivered by her coworkers at Delta Airlines in tribute to her. As one of her friends said to me, “Our service scores may be down a little for the month of October, but it was worth it – we all spent time on flights in the galley folding our fingers silly.” Each crease, each detail, was crafted with their love and dedication. 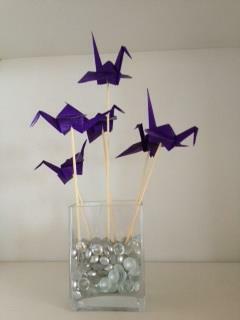 The Purple Crane Project puts into action everything I could hope for as a tribute to Jan’s memory. Simply put, it gives hope wings and sends them up with a prayer. Shawn’s selection of poetry that morning was the key. It is a reminder for all of us that magic still exists and wonderful things can come from letting go of control, even when we think we really need it. contemplate the recipient one thousand times. This entry was posted in Cancer, General Rambling, Support and tagged Jan Veile, PanCAN, pancreatic cancer, PurpleStride, sister, Support. Bookmark the permalink.